for the Arts production of "My Son Pinocchio." While the 1940 Disney film "Pinocchio" is certainly a movie to cherish, it largely fails to capture the thoughts and feelings of Pinocchio's creator, Geppetto. Luckily, those of you who yearned for a better glimpse into Geppetto's mind while watching "Pinocchio" can now do so via the SCERA Center for the Arts musical "My Son Pinocchio," which focuses on Geppetto becoming a real father as he deals with the joys and heartaches of parenthood. Oh, and if you're into entertainment that contains plenty of visual flair, you'll also enjoy the LED lights and bubble machines used in this production. 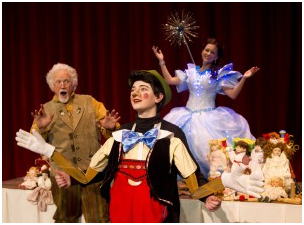 "My Son Pinocchio" is being performed on Mondays, Thursdays, Fridays and Saturdays through May 12 and begins at 7:30 p.m. Tickets are $12 ($10 for seniors, students and children) and can be purchased by calling (801) 225-ARTS or visiting www.scera.org. The SCERA Center is located at 745 S. State St. in Orem.